The most anticipated novel of the year of 2013, here we go! From the same author, once again, the readers will be very much dragged from words to words into highly imagination in finding an unexpected truth of formerly suicide case of a model...with a new guy with no magical skills, Cormoran Strike. Together with his helpful secretary, Robin, Strike was asked to reopen the drown-as-times-go-by suicide case of John Bristow's adopted sister, who happened to be a supermodel, Lula Landry. She was found dead, fallen from her balcony apartment. However, John was certain that it could not be suicidal attempt. Uninterested at first, Strike went to see and interview some people related to Lula to have more clues any way. This was how he finally changed his mind about the case, because there was really a missing link around Lula's death. Until a witness (and a neighbour of Lula's), Tansy, testified if she heard the mixed-race model quarreled with an unknown man. But our expectation for the light at the end of tunnel for the adventure ceased when the statement was sort of seen to be impossible that how she could hear the voices if she lived two level below Lula's place. A twisted fact behind what happened to her that night was another story. The ending...wasn't that shocking if you love crime fiction stories, making the whole story point actually usual one. Not that fresh. But the way Galbraith depicted the story, deep and complex characters brought out along the story and the writing style of British adventure novel---speaking of the sense and soul---are the ones that let this book as one of the page turners out there. Plus, Indonesian translation is a nice one, with perfect words to interpret the whole exquisite yet twisted journey. 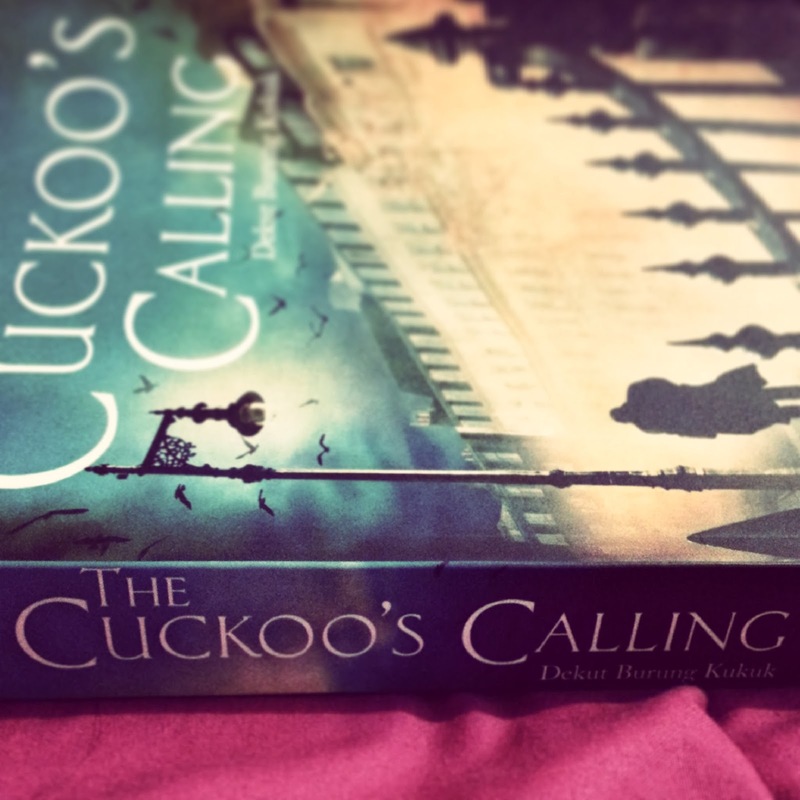 The Cuckoo's Calling is the proof on how the author (Robert Galbraith or J. K. Rowling) understands very well about how people might fantasize her imaginative story, although she has hopped to another genre. banyak yang bilang terjemahannya agak kaku, tapi baca versi aslinya juga...kaku. Jadi lama bacanya. Atau apa memang alurnya lambat, Bree? Englishnya gak baca sampai kelar, boleh buka liat-liat bentar di toko buku. Kalo compare dengan terjemahannya, diksinya ngepas meski banyak yang jadinya kata-kata asing dibaca. I think Galbraith was sort of holding something back in writing this one, though, as if trying to balance his/her natural fantasy with logical aspects. Tapi lumayan lah, meski sebenernya ceritanya biasa aja kayak nntn tv show crime fiction. The point of the whole storynya mah begitu aja. Twistnya aja yang bikin seru. An exciting story of jealousy, covetousness, and love set against a background of the callousness and emptiness of the lives of super models and super celebrities. The protagonist, Strike, is an almost larger than life character who wins you over with his meticulous investigational techniques. Surely, he is too good of a character along with Robin, his secretary and girl Friday, not to appear again in another novel!